There’s room for taste and innovation in India’s wedding rituals, but not now. Many of us are now bemoaning this tendency. 2018 was a year of splashy celebrity weddings, in which movie stars and billionaires seemed to be passing the baton, one reception to the other, to create one single, tinsel-streaked extravaganza, like a real-life re-enactment of Hum Aapke Hain Koun, the 1994 blockbuster often described as a very long wedding video. In the past month, actors Deepika Padukone and Ranveer Singh were married at Lake Como in Italy, at an occasion graced only by a few friends and family but scrutinized by millions. Priyanka Chopra and her American beau Nick Jonas had a traditional Hollywood wedding, which is to say it was branded within an inch of its life and packaged for People magazine. The bride wore a 75ft-veil to the Christian ceremony, misreported in many papers as “Catholic". Nick Jonas was brought up in a Pentecostal household, part of a religious denomination which, among other things, tends to frown upon ostentation. But what was low-key about this year’s viral, splashy blowouts? They made it apparent that the Indian wedding is as much a temporal affair as a spiritual one. In 2018, no one, or at least not the couple, wants to be seen thinking of the lifetime ahead. This was the year of the maximalist wedding, as well as of elite objections to unsophisticated displays of wealth. But elites were not their primary audience, if you discount the guests who did get flown to Como or bag the fort-facing rooms at Umaid Bhawan Palace. Hindi movie stars act in the multiplex movies that have made Bollywood acceptable to many Indian Anglophones, and their Insta stories may bring us algorithmically closer to them. But they didn’t marry to set trends. Their celebrations were about adhering, faithfully, to an already existing template of aspirational Indian weddings. Their regimented splendour, whether Sonam Kapoor’s Punjabi dance party or the elaborate Padukone-Singh celebrations, seemed like extensions of their screen roles. Weren’t the Kapoors dancing to songs from their own movies at some point? Didn’t Padukone and Singh look like they were cosplaying Sanjay Leela Bhansali characters? Chopra and Kapoor both took their husbands’ last names, drawing snide reactions, especially since Kapoor professes herself a feminist, and Chopra’s first work appearance after her wedding was at a meeting for Bumble, a dating app that also professes itself feminist. But not even the crustiest elder could have found fault with any of them. There were more choodas on display than in a ladies’ carriage on the Delhi Metro in December. Large streaks of sindoor appeared on bridal foreheads. This look, explains Shefalee Vasudev, editor-in-chief of The Voice Of Fashion, “comes from the Sabyasachi school of thought and design ideology." Sabyasachi designed bridal outfits for Padukone, Chopra and Isha Ambani, among others. But Vasudev says her reporting and discussions with fashion stylists indicate that the actors “have been willing and happy converts to wearing symbols of marriage. Sindoor and chooda as shringar (adornment) are seen as romantic and pretty by a large number of newlywed brides. I am not surprised that the actors are no different." The journalist Rebecca Mead, in a book about the American wedding industry called One Perfect Day, recalls a joke told to grooms: “You’ve got to understand: She already had the dress picked out, she had the church picked out, she had the music picked out. You were the last element she picked out." Is it so hard to believe, that we, the fans, were the first element these happy couples picked out for their festivities? It was fascinating to see these wealthy 30-something metropolitans, Instagram habitués and globe-trotting sophisticates, go against the grain for their kind. Their own friends are probably getting married barefoot on beaches, or foregoing the ritual altogether. But they chose to put on large, conservative public spectacles because they know what their public wants to see. They may not set the mood of the nation, but Hindi movie stars have always known how to read it. To complain that Bollywood weddings are inauthentic is really to complain that water is wet. Padukone’s Saraswat Brahmin ceremony may have featured a Kanjeevaram from Bengaluru, but I doubt anyone looking at her pictures would be able to tell you how a coastal South Indian community’s wedding differs from a Sindhi one. Among the many things that Hindi movies take from around the country and render in stereotype as one-note “Indian," the three-day mehendi-sangeet-shaadi template is among the most successful. Fair enough, you think: for the first time in history, Indian brides and grooms are expected to have fun at their own weddings. Ask an upper-caste Maharashtrian or Tamilian if they could have gotten away with a “youngsters’ party" in any other era. In my own community, where our great-grandmothers consented to a union by formally accepting a length of cloth from a suitable man, Nair brides now want to arrive at their weddings under a canopy of flowers held up by their cousins, something that only gained currency in Kerala (and, I suppose, the Gulf states) thanks to its appearance in Bollywood romances about rich Punjabis. And what of those tradition-bound Gujaratis, Mukesh and Nita Ambani? Of the wedding of Isha, daughter of the Ambanis and Anand, scion of Ajay Piramal, little remains to be said. Henry James once created a villain who thought it proper and reasonable for his well-bred young daughter to “not carry half her fortune on her back." The dissatisfied may neglect to say so, but it must be acknowledged that Isha and Anand wore not even a fraction of their net worth on their persons. Meme factories reaped rich dividends from A-list stars dancing in the background of the Ambani-Piramal sangeet, but I would be feeling pretty good about the whole thing if I were Karan Johar. From the video of Anant Ambani dancing to a song from Kuch Kuch Hota Hai to the Ambanis unironically performing the comic “G-U-J-J-U" bit from Kal Ho Naa Ho—perhaps the only time a Karan Johar movie has been rude about rich people—it seemed that Bollywood had made the rich dream, rather than the other way around. But yes, things were different in simpler times, when rice was rationed and the middle class static. Indira Gandhi’s biographer, Katherine Frank, saw video footage of her subject’s wedding to Feroze Gandhi, in which guests were served a simple dinner of rotis and green vegetables. Of course, that was in 1942, when World War II, Gandhian austerity and money troubles came together in perfect conspiracy with her family’s taste for restraint. In 1965, bristling from another round of war, Lal Bahadur Shastri’s government introduced controls on wedding spending around the country, which is why some family photographs from those years make our elders look wonderfully, almost romantically austere. Some find it convenient to blame liberalization for the whole aesthetic shift away from cassata ice-cream and very tiny zari bootis on the wedding sari. But this country is only 70 years old. Almost all our money is new money, and would have been even if there was much less of it going around than there is now. Secondly, the Indian wedding, across class, caste and religion, habitually aspires to outrageousness. With very few exceptions, most Indian weddings are lavish by the standards of those who pay for them. Expenditure on daughters’ weddings is a major anxiety for wage earners in India, ranking only behind medical bills. Last year, MP Ranjeet Ranjan introduced a private members’ bill seeking to prevent extravagant wedding expenditure. The Indian data journalism site Factly notes that 10 such bills were introduced in the last 30 years. In 2012, a Planning Commission panel working on improving anti-dowry laws recommended that lawmakers consider income-based limits on wedding expenses and gifts. 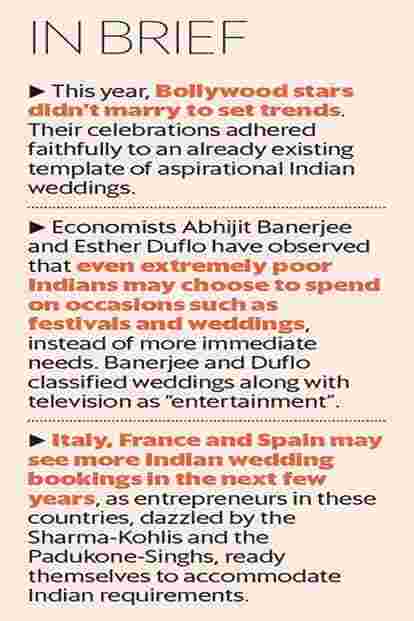 Economists Abhijit Banerjee and Esther Duflo have observed that even extremely poor Indians may choose to spend on occasions such as festivals and weddings, instead of more immediate needs. Banerjee and Duflo classified weddings along with television as “entertainment", a categorical definition that is very well-suited to this year’s wedding news cycle. Funnily enough, the only people in India who don’t need to splurge on their own weddings are the famous, whose reach on social media directly corresponds with others’ desire to give them free stuff. The truth is that no one expects Indians to marry within their means. Most of the décor and all the clothes at 2018’s celebrity weddings looked expensive, whether or not we thought them beautiful. That is the goal of most wedding expenditure. Big jewellery, high turbans and giant lehngas aren’t just meant to make brides and grooms look rich: they’re meant to make them look khandaani, of exalted family. In other words, you want to look like your father bought you your clothes. “Young people enjoy the thought of being a prince, a princess," Parthip Thyagarajan, CEO of WeddingSutra.com, a popular bridal media platform, says. I asked him if he thought the weddings this season were setting new trends, but he demurred. If celebrity season is good for weddings, Thyagarajan thinks, it’s because these actors have made tying the knot look like fun to a lot of people. How little a dance party on Lake Como has in common with that bureaucratic necessity, “solemnization". Como may be out of the question for many—too far for elders, too costly, too done—but destination weddings are hardly new to rich Indians, Thyagarajan explains. I learn from him that wealthy Delhi families have a taste for getting their scions married in Monte Carlo. Italy, France and Spain may see more Indian wedding bookings in the next few years, as entrepreneurs in these countries, dazzled by the Sharma-Kohlis and the Padukone-Singhs, ready themselves to accommodate Indian requirements. 2018’s extravaganzas are unlikely to cause wedding budgets to expand across the board, according to Thyagarajan. Another planner, who specializes in environmentally conscious weddings, pointed out that even low-key celebrations in India are expensive, simply because even tiny weddings have big guest lists. “Even small Indian weddings are so big that a weekend in Goa sets you back by at least ₹ 25 lakh," Sejal Deshpande, who runs a company called Shaadi Ityaadi in Mumbai, says. If you’re an upwardly mobile couple in Mumbai, congratulations: a Goa weekend is probably cheaper than a dinner, a dance party, a ceremony and a reception within the city. To break the internet, first marry rich. For all this, it isn’t immediately clear that the big, happy wedding signals any change in that other awe-inspiring institution, the Indian marriage. Until two or three generations ago, few Indians smiled for their wedding portraits. It wasn’t the style then, but presumably they also knew there was, by and large, little to smile about in what they had done. Like so many other Indian rituals dictated by social status, marriage was a duty to be fulfilled. We are still overwhelmingly unlikely to marry outside caste and community; Chopra’s youthful Caucasian groom was a notable exception even among her cohort of successful, independent female stars. In the week of the glittery Ambani wedding, Prime Minister Narendra Modi made a speech in which he appeared to sneer at his political opponent, Sonia Gandhi, as “Congress ki vidhwa"—the Congress widow. Widowhood is not a personal failing, but Modi clearly intended it as an insult. In a country where female misfortune is tied so closely to marital status, it was a reminder that for many of the laughing brides on Instagram, 2018 was the beginning, not the end, of a lifetime of maximalist expectations.